When Bayan Tawfiq, a devout Muslim, checks into a hotel, she asks that all alcohol be removed from her room. She says she likes to travel to Islamic countries where she feels comfortable and does not have to read the menu carefully to check if any ingredient in a dish is not halal. “I prefer going to places where people do not look at me strangely because of my questions or requests [for certain foods],” says Tawfiq, who wears a hijab. According to CrescentRating, a company that works towards developing the halal-friendly travel segment, the market was worth $130 billion (about Dh477 billion) in 2012, or 12.5 per cent of the total global outbound tourism market. It predicts the market will be worth $200 billion by 2020. A recent report by the Dubai Chamber of Commerce and Industry says family tourism is rapidly growing and is expected to increase to more than Dh665 billion within the next four years as more people embark upon so-called halal holidays. The Dubai Chamber reports that GCC states contribute 31 per cent of total spend by travellers in tourism-related activities, despite the sparse population in the region. Khalid Jasim Al Midfa, Director-General, Sharjah Commerce and Tourism Development Authority, believes the UAE can offer various types of holidays. “We are well diversified and have seven destinations,” he says, referring to the attractions offered by the seven emirates. Al Midfa says 37 per cent of hotel guests are from GCC states and emphasises the fact that Sharjah is dry, with no nightclubs or shisha cafes. Highlights include the Sharjah Festival of Lights, Sharjah International Book Fair and the Water Festival. 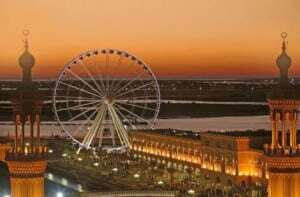 Al Midfa says Sharjah was awarded the Capital of Islamic Culture this year by the Organisation of Islamic Conference (OIC) member states and the emirate is getting ready for grand celebrations as the Arab Tourism Capital next year. The Taj Palace Hotel was the first five-star property to open in Dubai in 2001 to offer this concept. It has no nightclubs and no alcohol is served. Asser Samy, Director, Sales and Marketing at the Taj Palace, says more UAE hotel chains have adopted the concept and do not serve alcohol. It’s not just Arabs and Muslims flocking to such hotels, but also Europeans and Russians who like the quiet atmosphere, unlike at other hotels with nightclubs, he says. Al Jawhara Gardens Hotel in Deira also doesn’t sell alcohol, and offers exclusive use of the pool, gym and sauna facilities to families. “There is a good demand from families and women who wear the hijab,” says Hani Lashin, Group General Manager, Al Jawhara Hotels. He disagrees with the notion that a halal hotel cannot make as much money as hotels that sell alcohol. CrescentRating reports huge growth in the halal food and beverage industry and notes that this extends to lifestyle and leisure activities as well. It says most hotels will eventually embrace halal requirements for Muslims, while also offering services and facilities for other guests. Salam! Halal holidays is definitely possible in the UAE. In fact like the articles have mentioned, the halal industry is growing. Even the number of hotels /that are Muslim friendly are on the rise such as : bit.ly/MuslimHotelcomDubai, bit.ly/MuslimHotelcomAbuDhabi. These industry are growing and its a market where there’s in fact a lot of opportunities!